Yesterday I talked with a friend in Albany, NY who told me that it was 20 below zero with the wind chill factor. Today Trisha and I went for a walk on the Santa Rosa Plateau (in Riverside County just north of Murrieta) and it was 86. If I had gotten on an airplane and traveled there, it would have been 100 degrees difference from takeoff to landing. A great day for a picnic, and three and a half mile hike and a few pictures in Southern California. 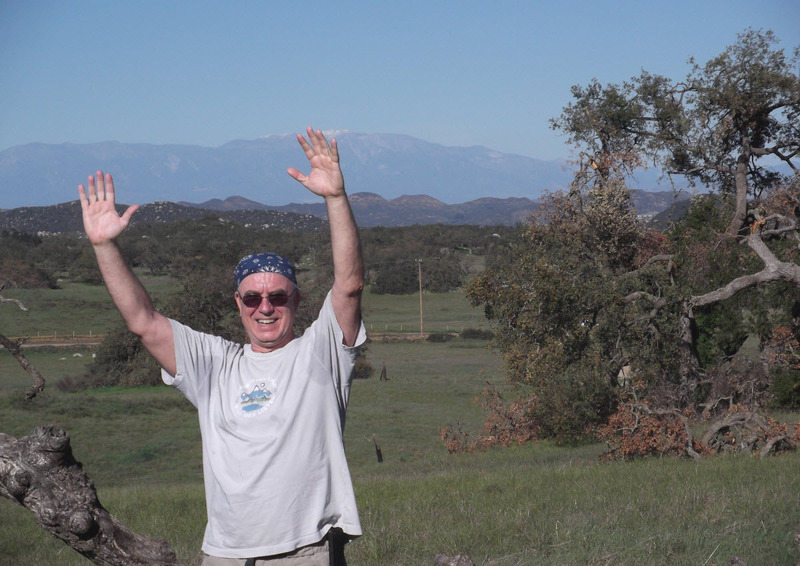 Here I am with the snow-covered peaks of San Gorgonio behind me, more than 70 miles away. I love those mountains. If you haven’t been there, the Santa Rosa Plateau is a great nature preserve in the rolling hills of Southern California, with wildflowers, lots of live oak, sporting a historic Adobe ranch and also vernal pools. The hikes are easy with no great elevation changes, and range from just a mile or two to larger circles of 10 to 12 miles. The best time to go is in winter and spring – right now.